In 2010, as a result of state judicial discipline proceedings, seven judges or former judges were removed from office. In addition, 18 judges resigned or retired in lieu of discipline, pursuant to agreements with judicial conduct commissions that were made public, and agreed not to serve in judicial office again. One former judge was barred from serving in judicial office in the state again. 100 additional judges (or former judges in approximately six cases) received other public sanctions in 2010. (Two judges are counted twice because they were disciplined twice). In approximately half of those cases, the discipline was imposed pursuant to the consent of the judge. Seventeen judge were suspended without pay, ranging from five days to one year, two of which were stayed in whole or in part with conditions. Nine of those suspensions included a censure, reprimand, fine, or probation. In addition, 17 judges were publicly censured; one of the censures was “severe,” one censured former judge also agreed not to serve again, one censure was based on the judge’s agreement to resign, and one censure also barred a former judge from serving in judicial office again. Conduct commissions publicly reprimanded 42 judges (one reprimand also included a $5,000 fine, and one included a $6,000 fine), publicly admonished 19 judges, and publicly warned one judge. Three former judges were sanctioned in attorney discipline proceedings for conduct while they were judges. One judge was ordered to pay a $2,400 civil penalty. Those figures do not include pending recommendations or decisions that were pending on appeal at the end of 2010, two of which have been decided in 2011. 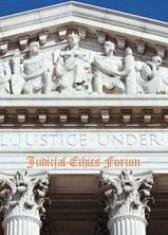 The American Judicature Society Center for Judicial Ethics has started to keep track on its web-site of states’ adoption of rules requiring disqualification based on commitments & campaign contributions. The document, which will be up-dated when there are new developments, is at http://www.ajs.org/ethics/eth_disqualification.asp. The judge knows or learns by means of a timely motion that a party, a party’s lawyer, or the law firm of a party’s lawyer has within the previous four (4) years made aggregate contributions to the judge’s campaign in an amount that a reasonable person would believe could affect the fairness of the judge’s consideration of a case involving the party, the party’s lawyer or the law firm of the party’s lawyer. The judge should consider what the public perception would be as to such contributions affecting the judge’s ability to be fair to the parties. Contributions within the limits allowed by the Oklahoma Ethics Commission will not normally require disqualification unless other factors are present. The document complements the similar reports the Center up-dates on case law since Republican Party of Minnesota v. White (www.ajs.org/ethics/pdfs/CaselawafterWhite.pdf) and state-by-state developments since White (www.ajs.org/ethics/pdfs/DevelopmentsafterWhite.pdf).